An auction of Penfolds Grange last week saw a number of record prices achieved at auction for the famous Australian brand. Conducted by Australian auction house Langton’s, the sale involved 1,420 lots of Penfolds and one extremely rare half bottle of Auldana St Henri, Magil 1911. Auldana is the name of the former Penfolds winery and the wine notched up AU$1,265 (£846). Another rare big seller was Penfolds Bin 379 Special Bottling Sauternes 1960, which sold for AU$1,208. A number of other previous records were broken in style. 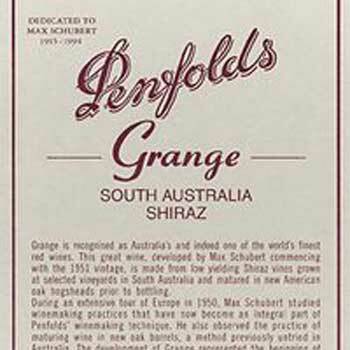 Penfolds Bin 95 Grange Shiraz 1961 that had previously sold for AU$2,187 went for AU$5,754; Bin 95 1971 broke its previous record of AU$978 when it went for AU$1,572 and Penfolds St Henri Shiraz 1961 went from AU$265 to AU$921. Other wines included in the auction were: Bin 28 Kalimna Shiraz 1967, Bin 128 Shiraz Coonawarra 1976 and Bin 46 Grange Hermitage 1959 (AU$3,047). Langton’s founder and general manager, Stephen Langton, commented: “The fact that the interest in super premium wines, particularly Penfolds Grange, keeps growing is phenomenal. There’s a great Australian pride in Grange.